A parliamentary report of 1777 recorded a parish workhouse in operation at Liskeard with accommodation for up to 60 inmates. Cornwall: Boconnoc, Broadoak, Callington (3), Calstock (4), St Clear (2), St Dominick (2), Duloe (2), St Ive, St Keyne, Lanreath, Lanselloes (2), Lantegloes-by-Fowey (2), Linkinhorne (2), Liskeard Borough (4), Liskeard Parish (2), East Looe (2), West Looe, St Martin, Merval, Menheniot (2), St Neot (2), Pelynt (2), St Pinnock, South Hill, Talland (2), St Veep. The population falling within the Union at the 1831 census had been 24,244 — ranging from St Keyne (population 301) to Liskeard Borough (2,853). The average annual poor-rate expenditure for the period 1834-36 had been £11,524 or 9s.6d. per head of the population. Liskeard followed Scott and Moffatt's standard design. It had a single-storey front block with a central entrance archway. To the rear lay a three-storey accommodation block with males placed to one side and females the other. The master and matron's quarters lay at the centre. 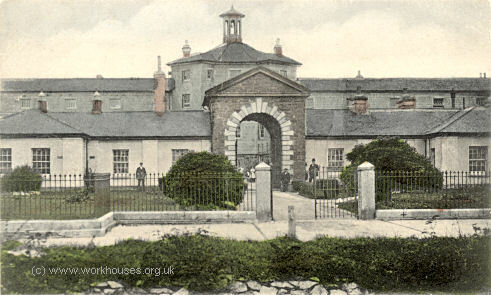 Liskeard workhouse form the south-east c.1915. In 1894, the British Medical Journal set up a "commission" to investigate conditions in provincial workhouses and their infirmaries. Following a visit to Liskeard, the commission's report found much to criticise about the workhouse infirmary which served the poor over a wide geographical area. The building was old and difficult to keep clean. There was only one bath and no hot water supply — any hot water required had to be heated in, and baled out of, a copper. Only one nurse was employed, assisted by a number of feeble-minded inmates; at night-time, these were the only form of help available in the wards. The commission recommended that a new infirmary be erected and extra staff appointed to supplement the existing arrangements which were described as "wholly insufficient". Further details are available in the full report. A new infirmary, at the west of the workhouse, was built in 1898-1899 at a total cost of £5,900. Liskeard infirmary block from the south-east, 2001. Liskeard former entrance block from the south-east, 2001. Liskeard former main block from the south, 2001. In the early 1900s, Liskeard Union operated a scattered home for pauper girls at 6 Westwood on Old Road. 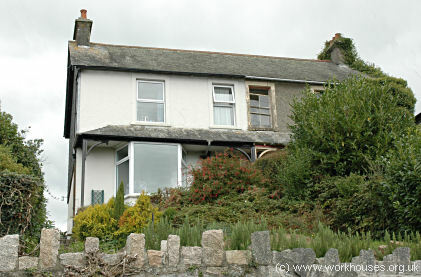 In 1914, a children's home was at 5 Wadeland Terrace, New Road, Liskeard. Cornwall Record Office, Old County Hall, Truro, Cornwall, TR1 3AY. Few records survive — holdings include Guardians' minute books (1894-1929); etc.